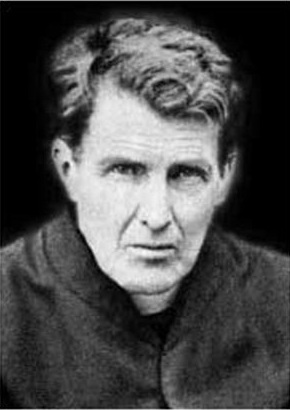 We continue our celebration today of the impending historic beatification of Fr John Sullivan with some reflections today and tomorrow on his prayers and writings. This is not an easy task, as there are not very many of them. Fr Fergal McGrath SJ, his first and probably most important biographer, says that it is as if Fr Sullivan went out of his way to make life difficult for biographers as he left so little written material behind him. This collection of prayers and sayings from Fr Sullivan are taken from Fr McGrath’s biography. I should take all my troubles to the Tabernacle. Nothing is too big for Our Lord and nothing is too small. Of Mary Magdalen Our Lord said, “Many sins are forgiven her, for she hath loved much” (Luke 7:47). We should never criticise sinners. Our Lord rebuked those who did so. It was His charity that urged Him to leave Heaven and become man for my sake. It was His charity that urged Him to suffer and die to save me. It was His charity that urged Him to institute the Blessed Eucharist which is, of all the proofs of His love for me, the greatest. Because a higher and better gift Jesus Christ could not give me than His own Flesh and Blood. Love, and love alone, was the secret of the saints. Charity is the lily, all over virtues are but common flowers. Charity is the purest virtue of all. It was the favourite virtue of Our Divine Lord. Consider your own faults and you will not have the courage to launch out against others. Teach the children to cling to the Heart of Christ, to cling to the Cross of Christ, to cling to the Mother of Christ. Prayer and work are necessary in order to lead a sinless life. One would think that there could be no excuse for the wickedness of the Jews, but Our Lord found one. Prayers for our enemies are the most powerful of all prayers, and will bring untold blessings on those who utter them. Who art Thou, o Lord, and what am I? You are my Creator; You brought me out of nothing and gave me the precious soul, which I am to save for your greater glory and honour. You are Lord of all. You make out of nothing. And I…? Who am I? A worm of the earth that can do no good of myself. Try to lead a comfortless life. Every victory over self is a victory for God. There is nothing grander on God’s earth than teaching children Christian doctrine. Teach them piety. Impress on them that God is their Father. Tell them about His love for each one of them. Teach them humility. Tell them they can do nothing without God’s help. Teach them self-restraint. How they must overcome their passions.